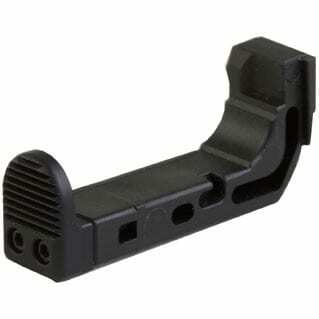 Upgrading to a superior, extended magazine release from your OEM unit is a simple and easy way to improve your Glock. Here, we’ll look at reasons to do it, what you should consider before shopping, as well as the best extended mag releases for Glock of the year. We’ll also examine the pros and cons of each so you can make an informed buying decision. Small Hands: Extended magazine releases offer a better hold for those with smaller hands, with more surface area to grab and less chance of accidentally hitting the release button. Easy: If you have a habit of skipping more complex modifications, keep reading, because swapping a magazine release is easy. 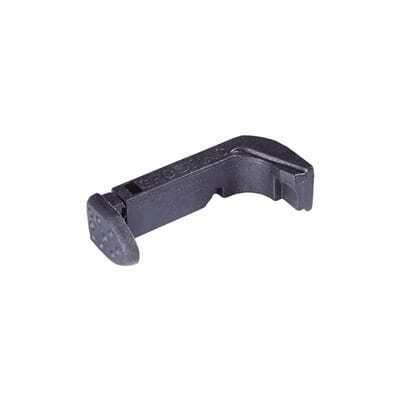 Improved Durability: The stock mag release is made from polymer alone, while some replacements use better, more durable, parts. Better Ergonomics: An extended mag release often improves the feel and grip beyond the length change. Reduced Margin of Error: The chances of improperly releasing your magazine is reduced, no matter where your finger is on the control or in which direction you press. Concealed Carry: A good extended mag release is likely to still be concealable, but it may be more difficult to do so. Budget: While an extended magazine is a great investment, your funds might be better spent on other priorities, such as an improved scope. Adjustment: As with any upgrade, especially those that alter the grip, you’ll need to readjust. Large Hands: Extended mag releases are typically ideal for those with smaller to average hands. We think the pros definitely outweigh the cons, but you should certainly consider the whole picture before committing to a purchase to get the best bang for your buck. ​Since all extensions aren’t the same length, this is an obviously big concern, especially if you’re focused on concealed carry. A really long length will make it difficult, while a moderately longer mag release shouldn’t pose a problem. ​Extended mags are not just longer, but often wider, too. This is great for those who have different sized hands or want a larger release button. ​The stock mag release is made from polymer. While not a bad material, many improve upon this, so you should opt for polymer only if you prefer the other available features. ​Yes, an extended mag release should theoretically improve grip by its nature, but if it has a bad grip itself, it can quickly cancel this benefit out. ​Lastly, you don’t want to pick up a cheap extended magazine release that is wider, longer, or made of better materials, but doesn’t actually release mags reliably. Quality of function has to match the quality of features, or there’s no point in upgrading! Now that you whether an extended magazine release is right for you, and you know what key features to look for, let’s examine the best products on the market. We’ll take a look at how each improves the grip and ergonomics of the stock release, as well as how the button itself may be safer for most users. 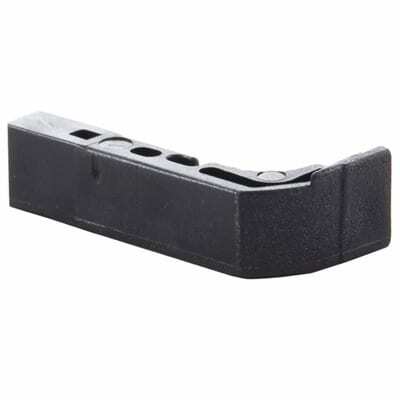 While the Tangodown Vickers Glock Extended Magazine Release does not improve upon the factory part’s polymer, it is nonetheless tough and durable, and more importantly, adds some key length to your mag release. It will provide a grip texture essentially unchanged from the stock part. A longer release enables those with average or small hands to quickly release the magazine without having to shift your Glock. Additionally, this part is mandatory for some popular accessories, such as Crimson Trace lasers, which attach with your weapon backstrap and move your hand from the release. The release button itself is 3/64” longer than the stock release button, allowing you to easily press with your thumb. For those who are moderately inconvenienced by the stock magazine release, this incremental difference is an excellent solution. It fixes the need to make an adjustment, while not being so extended that it’s possible to accidentally release your mag when grabbing your Glock too hard. In high-pressure situations, getting the balance right is absolutely key to prevent a catastrophic drop. The operation is smooth, a little more so than the stock magazine release. Again, if you’re not interested in drastic changes, but want a better fit for your hands, the Tangodown Vickers Glock Extended Magazine Release is the way to go, as it does not introduce unwanted variables. For those who want a moderate change while still having the same grip texture and function as the stock magazine release, the Tangodown Vickers Glock Extended Magazine Release is a go-to option. Taking a look at Glock’s own extended magazine release, we find that it largely mimics the same performance and feel of the stock magazine release, but with a larger size. In fact, this extended mag release should be familiar to users of the .45 cal frame guns, as it is the stock magazine release for those models. Whether you’re familiar with that gun or not, you’re familiar with the Glock’s existing, smaller magazine release. The same polymer construction is durable and comfortable to grip. One advantage to polymer is that it’s easy to sand down any excess length. They can also be serrated after this process by using a checkering file or a jeweler’s file. As with any extended magazine release, you’ll experience a lower likelihood of accidentally dropping a mag in a high-pressure situation, which is the most important aspect. You’ll also be faster to target with a more comfortable grip. The real appeal of a Glock factory part, however, is the price. Since this part is not a unique item, being the stock part of the .45 cal frame guns, Glock offers them at an exceptional price point. If you think you need an extended mag to accommodate your hands but aren’t sure whether it’s right for you and don’t want to spend more for extra features, this is the way to go. Depending on your results, the price is minimal enough that it won’t be a waste if you want to upgrade again afterward. If you’re on the fence about whether or not you need an extended magazine release, buying a factory part from Glock is a great idea. You’ll spend very little money and get a feel for whether or not it works for you, enabling you to either keep it or upgrade with virtually nothing wasted. Excellent Construction, Combining Polymer With Steel and Aluminum in Key Places. If your budget provides for more than dipping your toe in the water, we strongly recommend the T.H.E. Accessories Competition Magazine Release For Glock, as it offers a number of distinct advantages to magazine releases that more closely mimic the stock part. You’ll get a serrated aluminum button that extends a full 1/4” inch to the magazine’s rear, providing a much better position. This makes the button easy to reach with no adjustment to your ideal shooting grip. It works well for those with smaller hands but also fits well with average hands thanks to this angle. T.H.E. Accessories has also changed the factory release so that there is no metal coming into contact with plastic magazines. You can expect flawless performance with this smoother operation. Despite this change, it is assembled just like an OEM part, adding a couple of small screws to secure the thumb pad. While the construction is primarily polymer, key parts are not. 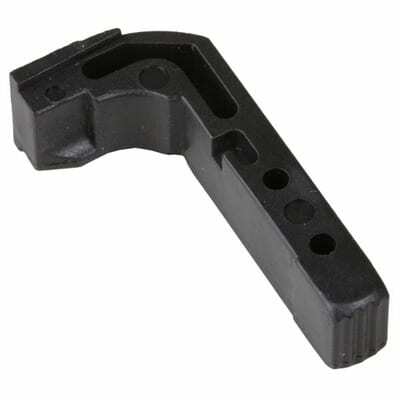 This enables for an overall lighter magazine release that has durable components. Namely, the screws, as well as the thumb pad, will not wear over time and provide better grip and texture. The downside is that they do not work with any of the Gen 4 pistols, so this is limited to those who only have a 1-3 Gen Glock. For those with a Gen 1-3 Glock, T.H.E. Accessories has created a super product in terms of durability and design to ensure the best grip and smooth function. Ghost’s parts for Glock are always widely loved and their extended magazine release is no exception. 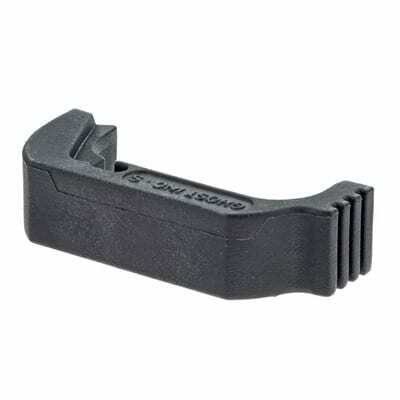 Specifically made for Gen 4 Glocks, this extended magazine release offers several great advantages over the stock option. You’ll get a beveled and snag-free design that is compatible with many holsters. It can also be installed for those who are either left or right-handed, which is a common oversight of far too many accessories. Additionally, Ghost has made available models for large and small frame Glocks. The design is a proprietary polymer which appears to be more durable than the stock polymer and the texture provides a solid hold. The button itself is positioned the same as the stock, but wider, requiring very little adaptation. Overall, it really shines in its compatibility. Having an extended magazine release that won’t be accidentally engaged in a holster is obviously very critical and having one that won’t catch on your favorite holster is already enough of a problem that Ghost breezes past. While it doesn’t change too much about the basic design, it’s a superior build that adds ambidextrous function along with extended length. As such, it’s a great, higher-quality alternative to simply purchasing Glock’s factory extended magazine for those more certain that an extended mag is a good idea. The bottom line is that this extended magazine release is highly compatible with many setups and users. For those who are more certain that they could benefit from an extended magazine—and have a Gen 4 Glock—Ghost’s simple Tac Extended Magazine Release offers an improved but familiar redesign of the stock part. The other offering by Ghost on our list is the X-mag Magazine Release for Glock, which is a more thorough redesign of the mag release. Featuring an innovative and ergonomic design with subtle curvature, this magazine release is designed to increase the speed of changes by positioning fingers not only at an ergonomic position for superior grip, but also near the button. The button itself is also ergonomically-shaped like a teardrop and depresses faster than other buttons but puts its pointed end forward to mitigate accidental presses. Overall, these features provide for a movement that quickly becomes second nature and is highly efficient. Additionally, the unique shape with subtle curvature is not too unique to cause fitting problems in most holsters but does prevent the holster from accidentally engaging the button. As with the other Ghost magazine release on our list, it is a smooth and snag-free design. It also features Ghost’s proprietary polymer blend which offers a solid grip and excellent product durability. Taken together, all these factors make for a superior product all-around. The downside is a natural result of the redesign: the unique shape will not feel comfortable in larger hands. It’s hard to hold that against Ghost because the entire point is accommodating those with smaller hands. That said, you should be aware that if this magazine release is used by another user with larger hands, its ergonomic shape and nuanced curves won’t mesh as well as a standard mag release. For those looking for a design that especially caters to smaller hands with unique ergonomics, the Ghost X-Mag Magazine Release for Glock is a sure winner. We’ve examined the pros and cons of getting an extended magazine release and whether swapping out your OEM release is a good idea for you. With a slew of excellent options, you’re sure to find the right replacement if you use our guide. Be sure to get one that accommodates your hands, and enjoy a more comfortable, safer hold!